With more than a billion cameras and sensors continuously generating video streams and data, getting real-time actionable insights is more challenging than ever. NVIDIA’s DeepStream SDK delivers a complete streaming analytics toolkit for situational awareness through intelligent video analytics (IVA) and multi-sensor processing. The DeepStream application framework features hardware-accelerated building blocks that bring deep neural networks and other complex processing tasks into a stream processing pipeline. Focus on building core deep learning networks and IP rather than designing end-to-end solutions from scratch. DeepStream SDK supports a diversity of use cases, using AI to perceive pixels and sensors and analyze metadata. It also offers the flexibility to deploy from NVIDIA Jetson™ on the edge to NVIDIA Tesla® in the cloud. The SDK lets you integrate the edge to the cloud with standard message brokers like Kafka for large-scale, wide-area deployments. This is ideal for applications like retail analytics, intelligent traffic control, automated optical inspection, freight and goods tracking, web content filtering, target ad injection, and more. The DeepStream SDK uses the open source GStreamer to deliver high throughput with a low-latency streaming framework. The runtime system is pipelined to enable deep learning capabilities, as well as image and sensor processing and fusion algorithms in a streaming application. To solve the most complex problems, you can easily build applications by using the NVIDIA-provided hardware-accelerated plug-ins. DeepStream also offers the ability to build custom plugins for user-created libraries and functions. One of many open-source plug-ins can also be easily adapted for use with the with the DeepStream framework. DeepStream’s modular architecture also lets you run heterogeneous concurrent neural networks that are critical to understanding video that’s rich and multi-modal. The SDK offers complete reference applications and pre-trained neural networks to jumpstart development. Applications built with the DeepStream SDK can now be deployed using a Docker container on NVIDIA Tesla platforms, enabling flexible system architectures and straightforward upgrades that greatly improve system manageability. 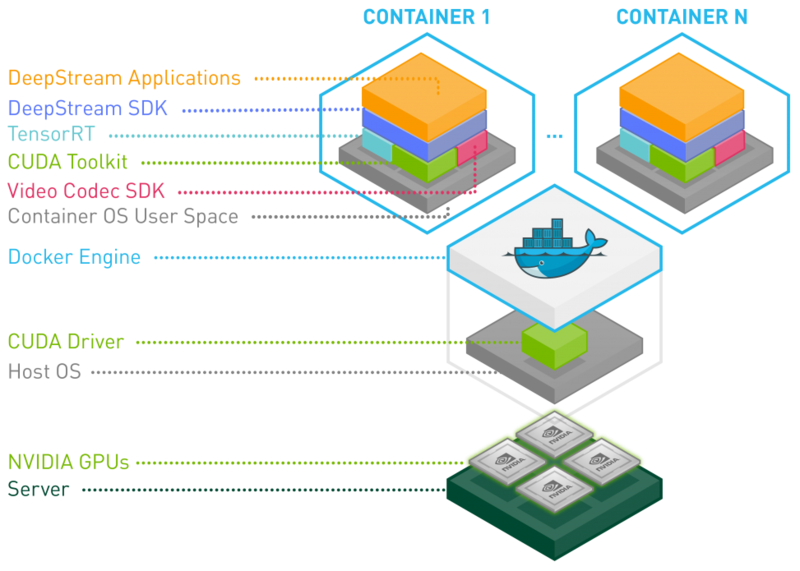 The Docker containers with full reference applications are available on NVIDIA GPU Cloud (NGC). The Transfer Learning Toolkit, along with DeepStream SDK 3.0, offers an end-to-end deep learning solution for IVA on Tesla GPUs. You can now accelerate development of efficient deep learning networks and prune networks to tightly pack complex applications, delivering high throughput and stream density.